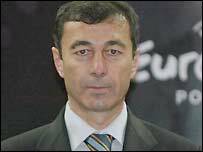 Bulgaria's Euro 2004 coach Plamen Markov has reveled he has turned down an offer to extend his contract. Markov's side lost all their games in Portugal but the 46-year-old, who has held the post since 2002, insisted: "I did not resign. "My contract expired on Wednesday and I told [Bulgarian football chief] Ivan Slavkov I would not prolong my contract as a coach of the national team." Bulgaria lost to Sweden (5-0), Denmark (2-0) and Italy (2-1) in Euro 2004.